Indicrat: A Different Perspective On Children Separated At The Border. A Different Perspective On Children Separated At The Border. When I was in India as a kid, other kids that were professional beggars would show me their bodily mutilations that their parents gave them just so they can be professional beggars. They had hideous scars, missing fingers and hobbled legs. Parents all around the world sell their kids to gangs or use them as a commodity, or tool, to get something better for themselves. I don’t automatically assume all parents are noble and virtuous when in Mexico, they stuff their kid into the trunk of a coyote’s car or have them journey with drug mules where they get raped or inducted into a gang. If some of those kids end up in foster care, that’s alright by me if their parents are that reckless, careless and selfish. Of course there are real asylum seekers, and it's too bad that the U.S immigration system is clogged up by so many fake asylum seekers that the real ones can't get adequately processed. I find it curious that all the people on Facebook posting about kids being separated at the U.S. - Mexico border never had a single thing to say about all the thousands upon thousands of unaccompanied minors that also, by definition, were separated from family. They are a much larger group than the ones separated from family at the border. Nobody gave a crap about them as they struggled through a dangerous desert with coyote rapists and drug mules. 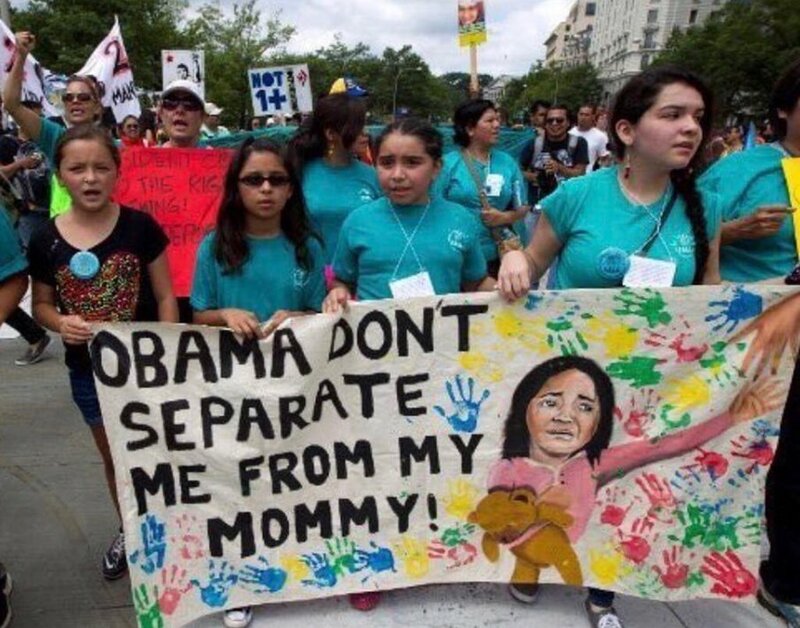 ...BUT if Trump is involved, then the Left is outraged about kids separated from families even though they are removed from detention centers in usually 24 hours and put into nice facilities with plenty of food, games, doctors, councilors and teachers which these biased Facebook videos NEVER show. They also never talk about the unsanitary conditions of these adult detention centers where a child with a less mature immune system is more susceptible to tuberculosis which is common in these holding facilities as well as lice and scabies. Why would anyone in their right mind want to subject a child to that? However, the accompanying adult can get the child back in 24 hours if they agree to leave the country. By law, the kids are held a max 20 days (Flores v. Lynch). I was forced to go to summer camp every year way longer than that, and I didn't have the entertainment these kids have in their facilities. This selective outrage reminds me of the Iraq war. When Saddam was killing 10's of thousands of his own people every year you didn't hear a peep from liberals, but as soon as George Bush got involved then all of a sudden liberals cared so much about the poor Iraqi people suffering, even though the war killed less Iraqis than Saddam actually killed. Democrats know the Inspector General is killing their fake Russia investigation so they have to "wag the dog" with these kids. 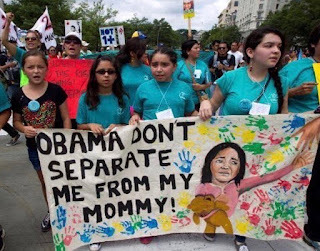 Pelosi and all the Trump resisters don't give a rat's fart about those kids. We already turn a million new immigrants into U.S. citizens every year. So, how many immigrants, legal or illegal, can this country absorb annually before they overwhelm our Welfare System, School System, Healthcare System and Justice System? ...What is the number? The Left never gives you that number. They don't want to answer that question. 1. Most illegals don't pay federal and state income tax. Less than half have an SSN or are on payroll. Illegals also displace American citizens from jobs where they would be paying taxes at higher wages. 2. U.S. citizen children get less attention from teachers and less services at school because of illegal immigrant kids increasing class sizes. Taxpayers pay to accommodate them. 3. Taxpayers foot the bill for emergency room and medical services to illegals. In fact, healthcare for illegals costs almost double what illegals themselves pay in taxes. 4. According to the U.S. sentencing commission Illegals commit disproportionately more crime than U.S. citizens, double the murder and robberies. Besides the burden to the victims, taxpayers have to pay for the Justice System to deal with that. 5. Australia has a living wage of $17.70 per hour because they don't import a glut of low wage workers into their country. They have way stricter immigration laws than we do. They'll put you on an island, then deport you. Mexico itself has tougher immigration laws than the U.S.
6. Illegal immigrants obtain welfare through their U.S. born kids. Approximately 62 percent of households run by an illegal immigrant receive welfare of some sort. 7. The Mexican government actively assists its own poor and other migrants to illegally cross the border because the United States is Mexico's social safety net. Mexico receives more money sent back by illegal immigrants than from sales of its greatest export, oil. Billions of dollars that illegal immigrants make in the U.S. get sent out of the U.S. economy. Besides the awful trade deficits, Mexico is a huge leech on the U.S. taxpayer. 8. In Japan you can leave your wallet on a bus stop bench all day long and it won't get taken. If Mexico was Japan, any typical Japanese wanting to get into this country would patiently wait in line. They wouldn't dare try to bum rush the border and break the law because that's their CULTURE, their mindset. It's not about race, it's about culture. People coming from south of the border come from very dysfunctional cultures and they bring that dysfunction into the U.S. That's why there's so many Hispanic gangs in the U.S. ...Yes, of course there are many illegals that are great and decent, but the aggregate influx of illegals also brings many problems. This is what Trump said in his simple, New York construction guy way. Under Trump, unemployment for Blacks and Hispanics in this country is the lowest IN ALL HISTORY, partly because of less illegals. If you care about poor people in this country having jobs, then stop supporting illegals and support more legal work visas and merit based immigration. We need immigrants, but the process must be SMART AND LEGAL. There's a simple way to not get your kids taken by Border Patrol: Don't cross the border illegally. My dad is an immigrant and my grandparents on my mother's side were immigrants, they did it legally.